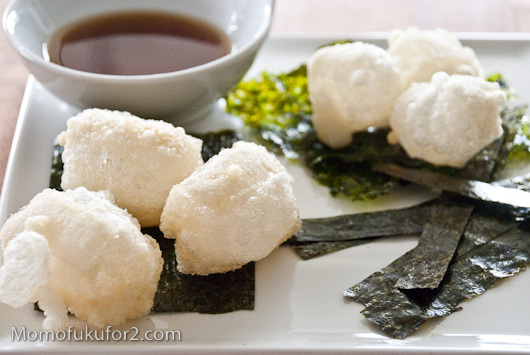 I have a bag of mochi sitting in my fridge, just waiting to be puffed up, brushed with soy sauce and sprinkled with toasted sesame seeds. 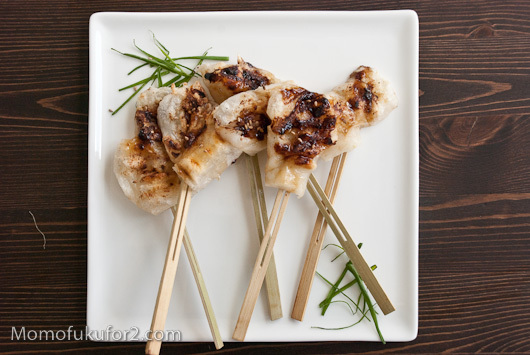 Grilled mochi makes the best snack: it’s fast, filling and completely satisfying. When I’m out for dinner I like checking out what other people are eating. I tend to do it unobtrusively – although Mike begs to differ – but when something really catches my eye, I’ll ask the staff what the dish was. Mochi-iso was one of those dishes for me. I only saw it for a second, but seeing those pale-golden puffs drizzled with sauce sitting on top of seaweed strips made me want it instantly.